I think this is the last one! The last one of my Occasions Catalogue stamp sets that I haven't inked up yet, except for my Perennial Birthday set, which I'm saving for the kit it goes with. I knew this stamp set, entitled A Good Day, would take me a while to figure out because it has a ton of small line images, which are my least favourite kind of stamp! 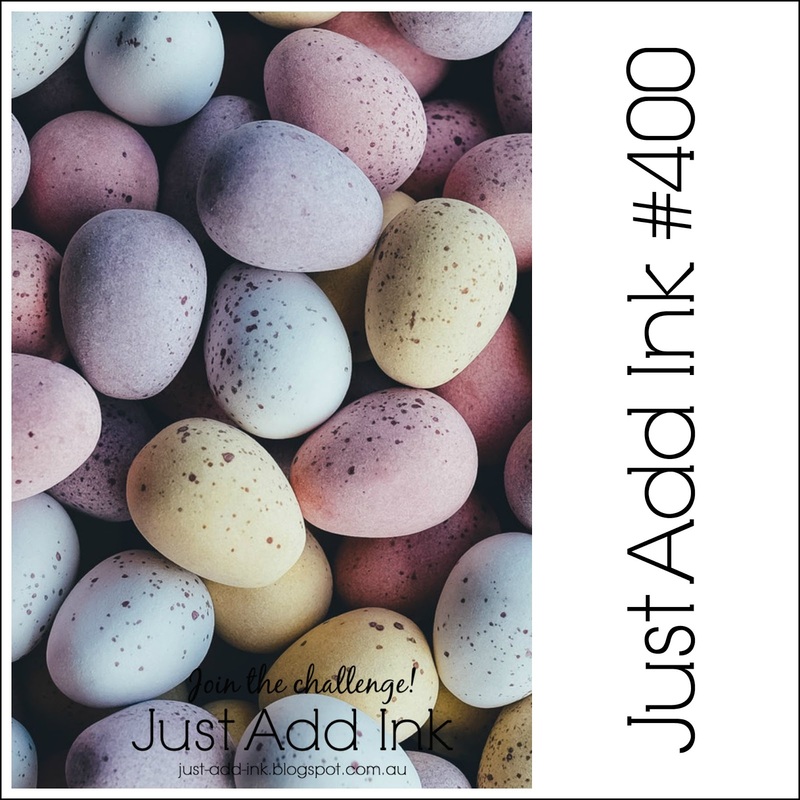 They are my least favourite because a) they don't fill up much of your space and b) are hard to colour in because they are so small, so c) don't provide much of a focal point. I bought the set, though, because of the tools and embellishments that it works with like the 1 1/8" and the 1 3/8" Scallop Circle Punches, which are new, and those adorable Mini Embroidery Hoops. I've been dying to use one of the embroidery hoops, too, but have put it off until now, due to the fact that I was trying to find a different image to use inside one, other than A Good Day stamp set! But when I saw Freshly Made Sketches' challenge for this week, the Mini Embroidery Hoop was the first thing I thought of, so I decided to make an Easter card with the little bunny image. 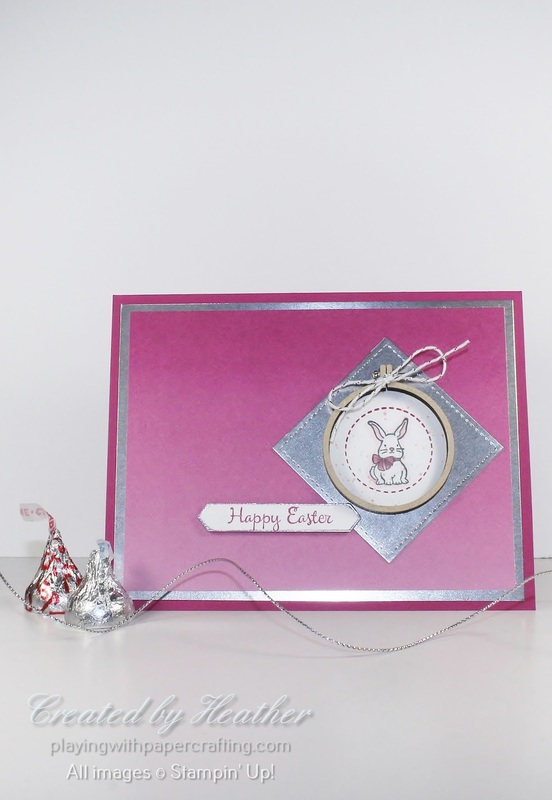 I settled on a colour combo of Berry Burst, Silver and White, with a little Pink Pirouette and Pool Party, and Light Shade of Rich Razzleberry mixed in as I coloured in the bunny with Stampin' Blends. I used the old Stampin' Up! retired Spritzing Tool to add speckles to the rabbit image, as per the eggs in the inspiration picture. The 1 3/4" Circle Punch is just about the right size to punch a circle for the back of the large embroidery hoop. I needed to trim the tiniest bit off after it was adhered. The stitched Silver Square is created using the Stitched Shapes Framelits Dies. 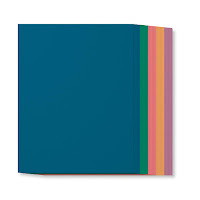 The background Designer Series Paper is from the Colour Theory DSP Stack in Berry Burst. 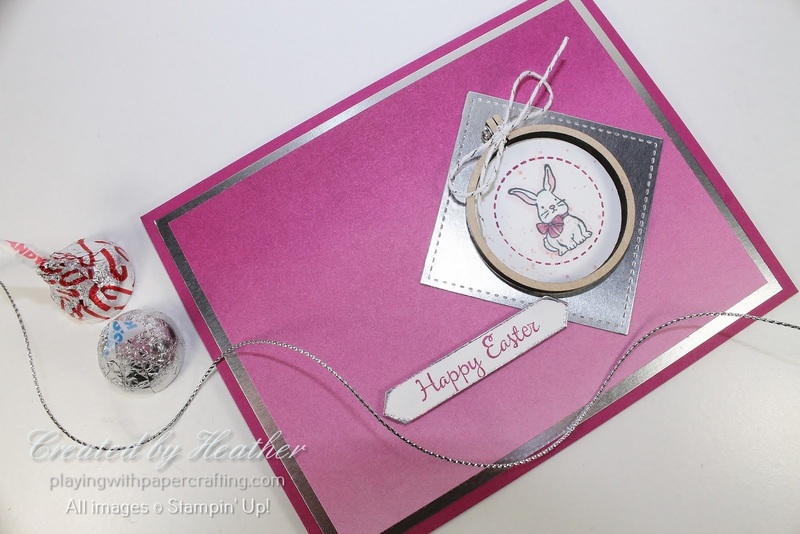 As you may know, every year Stampin' Up! 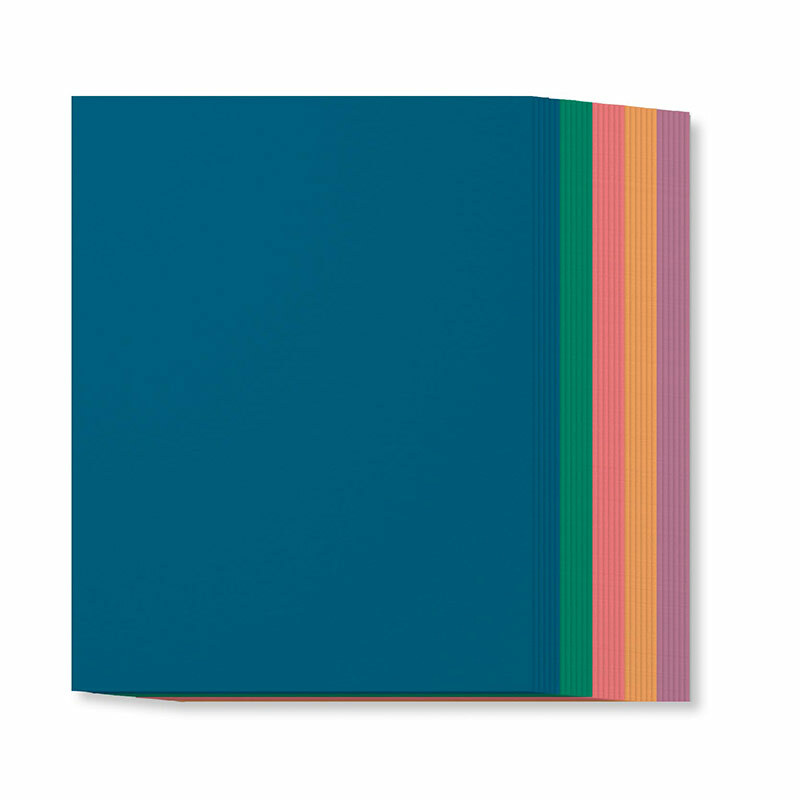 retires a set of 5 In Colours and brings in 5 new ones to stay current with trending colours. At the end of May, we will be saying good-by to our 2016 - 18 In Colours and if they were favourites of yours, like they were favourites of mine, I want to give you a heads up that now would be a good time to stock up on paper and ink before you cannot buy it anymore. Each year, when the Retiring List is published in April, the In Colour Products are usually the first things to sell out, and they usually go fast! Why not avoid the rush and disappointment and buy your extras now when you can earn Sale-A-Bration rewards for doing so?!! Don't forget to include Ink Refills! 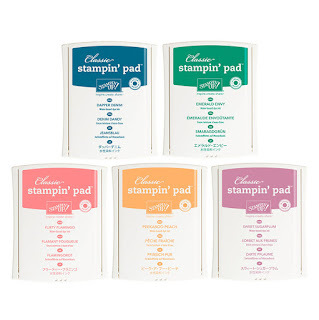 They will keep your ink pads in good shape for years! 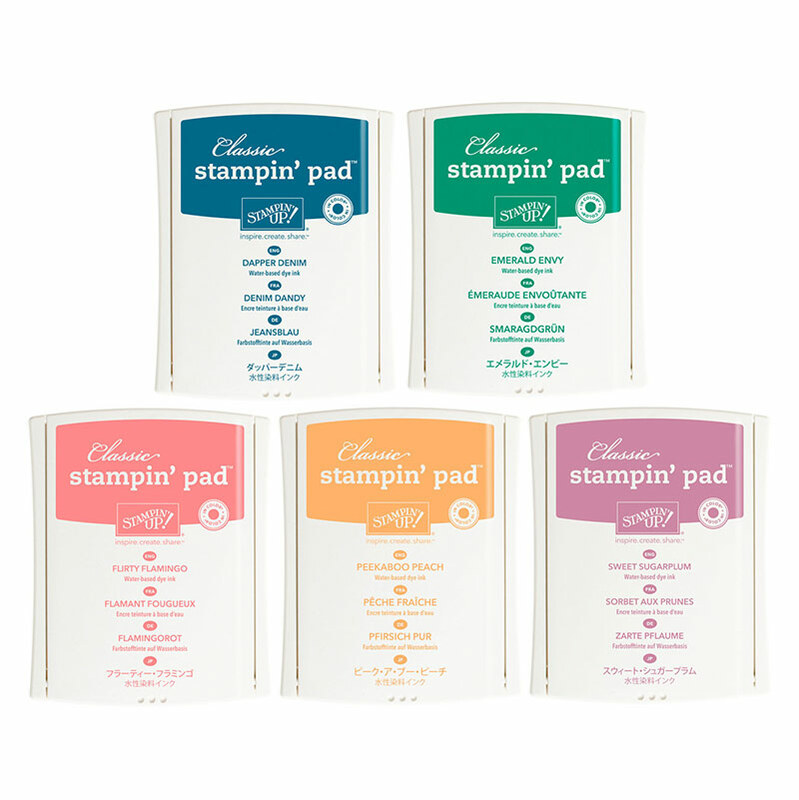 8 1/2" x 11" Cardstock Packs are $10 each so all 5 of them plus a couple of ink pads will earn you a Sale-A-bration Reward!! And don't forget: I'm offering Double Papercraft Cat Reward Points once your orders reach $60 and above! !